This insightful – and worrying – infographic neatly points out why it is SO important to recognise the multiple identities that queer people live out simultaneously. The stats here reference violence in New York – but you see the same trend all over the world. 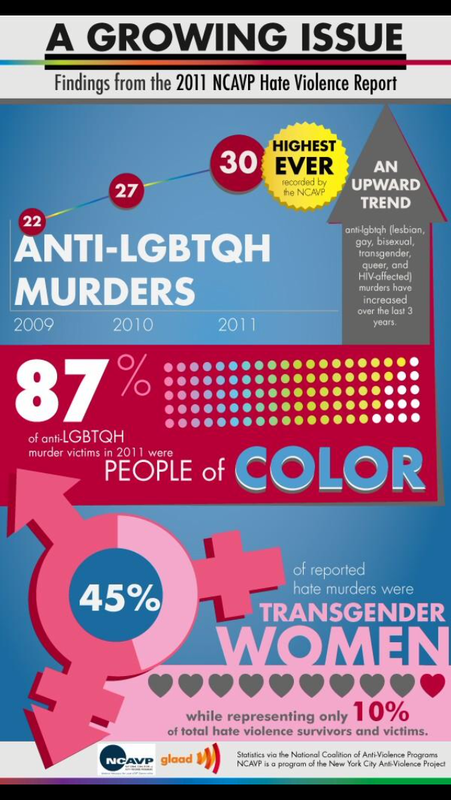 Trans and queer people of colour are at most risk of anti-queer violence, with trans women of colour by far the most targeted group. You will never save all queer lives by focussing solely on gay cisgendered men. You will never save all queer lives by focussing solely on white queer people. This is why we have to create a conversation that’s bigger than white, gay, cisgendered men. We love you and we want you to be safe. But to liberate all of us, we need all our voices.